Controversial calls, crazy bounces, a youth movement and a historic amount of free football. The NFL Conference Championship Recap might be the best of the 2018 season. WASHINGTON — You’re damn right I’m bitter. Before the season, I picked the New Orleans Saints to win Super Bowl LIII in Atlanta, and they’ve been robbed of that chance not because of some on-field choking or getting manhandled by a better team. The Saints season is over because of one of the worst no-calls in NFL history — a play in which not one, but two penalties occurred in one fell swoop, and completely missed by referee Bill Vinovich. This isn’t hyperbole or crying over spilled milk. Nickell Robey-Coleman admitted he committed the penalty, and the league immediately (and rightfully) admitted the officiating error, and now has to walk around with the black eye that comes from having one of its signature games decided by the refs, not the combatants on the field. Payton also told FOX immediately after the game that it’s “all the more reason we need more replay.” He’s not wrong; even if coaches aren’t granted the ability to challenge such plays late in the game, there should be a replay official on top of that. If some couch jockey at home can see an infraction plain as day, so should someone getting paid to make sure those penalties are called — and by any means necessary. So while the Saints are reeling from their second straight playoff heartbreak, the Rams are literally choosing what they want to wear to the Big Dance. And the rest of the league notices. Ok, enough ranting. Time to recap Championship Sunday, the first-ever to feature two overtime games. Tom Brady is old. Rob Gronkowski looks even older. 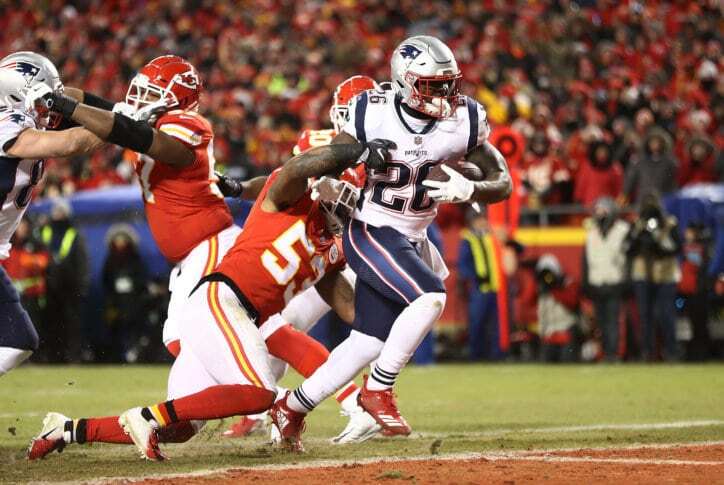 But they were both clutch, and rookie Sony Michel’s second straight 100-yard, multi-TD game is sending New England to their third straight Super Bowl to face the team they upset to launch this ridiculous stretch of nine Super Bowls in 18 years. It’s also a heartbreaking (and somewhat predictable) end to Kansas City’s storybook season. Even as mother nature seemed to be rooting for the Chiefs, they still couldn’t avoid their seventh home playoff loss in their last eight postseason games. Assuming Patrick Mahomes doesn’t have an RG3-esque ego trip over his marketability, the Chiefs seem destined to enjoy the symmetry of hoisting the Lamar Hunt Trophy in Arrowhead Stadium sooner rather than later.